Earn 6 SB per $ when you buy Jiffy Lube gift cards at MyGiftCardsPlus, powered by Swagbucks. 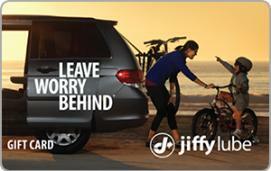 Jiffy Lube® believes every driver deserves to be free from the anxiety of keeping their vehicle in top shape. Their customers value their vehicles and depend on it to keep their life running. They understand the importance of an oil change and proper maintenance. Jiffy Lube does more than change oil. They are preventive maintenance experts and have the nation's only ASE-certified training program in the quick lube industry. Every Jiffy Lube has access to manufacturer's recommendations for all vehicle makes and models and even keeps customer service records on file in their nationwide database, so no matter where they are, their customers know that Jiffy Lube understands them and their vehicles. PLEASE TREAT THIS EGIFT CARD LIKE CASH AND SAFEGUARD IT ACCORDINGLY This eGift Card can be used only for purchases of goods and services at participating Jiffy Lube® service centers in the U.S. No value until purchased. This eGift Card cannot be redeemed for cash and no change will be given, except in those states that require redemption for cash. Except in certain circumstances, the value on this eGift Card will not be replaced if the eGift Card is lost, stolen or destroyed. No fees. No expiration. For balance inquiry, check your invoice or call 1-800-544-7537. For questions regarding your Jiffy Lube eGift Card, please contact your local Jiffy Lube® Service Center, visit giftcard.jiffylube.com or call the Help Desk at 1-800-544-7537. You may redeem this eGift Card? at participating Jiffy Lube® Service Centers in the US.